Long time no posts. I haven’t had the time to go through my queue and continue blogging. Well, I have given up cable so I am hoping to give my blog a new look and make some changes. A lot of things have changed since I started blogging – social media in particular. Anyway, back to Cairo Time. 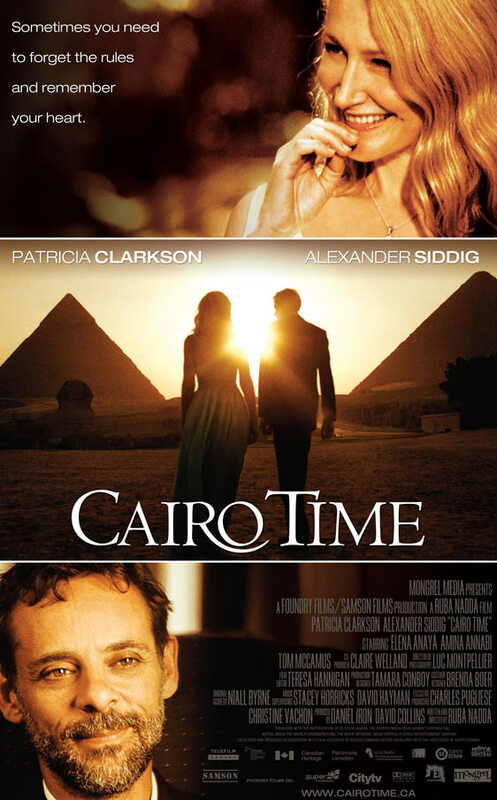 A movie is about Juliette (Patricia Clarkson) who is supposed to be on a holiday with her husband, Mark (Tom McCamus) in Cairo, but is instead accompanied by Tariq (Alexander Siddiq), one of Mark’s acquaintances, who takes her around the city. She travels around to see the desert, the beautiful Nile as well as witnesses an Egyptian style wedding. She learns that Tariq was once in love with another woman, Yasmeen (Amina Annabi) and got his heart broken. What follows is an unexpected attraction between Juliette and Tariq. Directed by Ruba Nadda (Sabah (2005), I think this movie is on Netflix Instant – another good watch), the movie is peaceful (I mean really peaceful, there is hardly any dialogue! ), romantic and drama-less. A good movie to unwind with after a long days of hard work. My favorite line: With very few lines to pick from, I cannot come up with any!